The other day I was looking for an easy project to do and realized I had left over Dixie Belle paint. I also had a lone dining chair in need of a make over. Together they were an easy painted chair project. 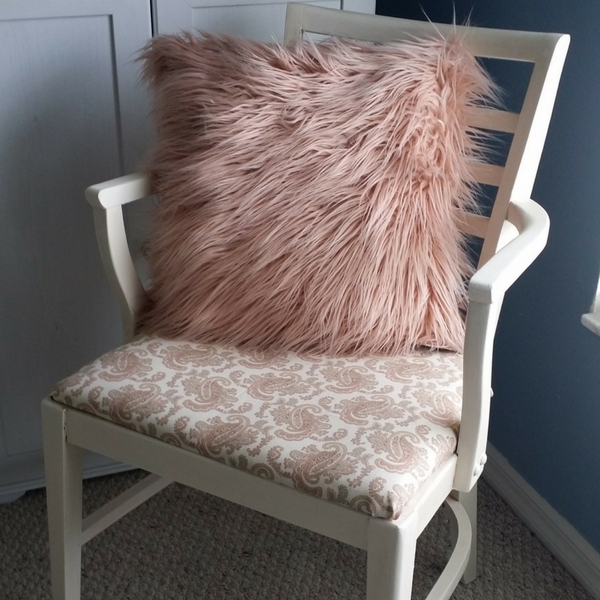 Revamping a chair really is one of the easiest projects one can undertake. All you need is a can paint, brushes and some fun fabric. The story behind the chair is that it goes with a set I inherited from my grandparents. It sat in storage for a while and the matching arm chair was infested with bugs. Unfortunately, I had to toss it out leaving me with only one arm chair. The remaining chair was a dull boring stained brown, and honestly, I thought it cold use a face lift. In an afternoon I was able to transform the chair into the perfect piece for my office. I love using Dixie Bell Paint, as I don’t have to sand down the pieces I intend to paint. I cleaned it up with a damp cloth to remove any dust on it. Then I took off the seat and set the chair on a drop cloth to start painting. It took a couple of coats of paint to cover it well. Painting the chair was the easy part. The struggle was finding the right fabric for the seat. I must have considered about ten different patterns before opting for the pink paisley. Everything from a cute black spotted fabric, to a cream and gray Parisian style print, and a few other patterns were in contention. Since I struggled to pick a pattern, Kevin helped me rule out a few of them. He’s got a great eye and will tell me if something looks a bit funky and not in a good way. The thing is, I usually agree with him. I settled on a pink and green paisley print. So, what do you think? It came out pretty well, didn’t it? Nicely done! The color scheme and fabric are TOTALLY you!